Mine are ok, I think! they are nice and green but are still quite small. The picture looks like a clump of seedlings rather than one plant. If there is more than one they need thinning out and planting about six inches appart. I would say they are going yellow because your soil condition is acid. Have they been drying out in dry weather?, is your tap water hard in your area?. I agree with Bulba. 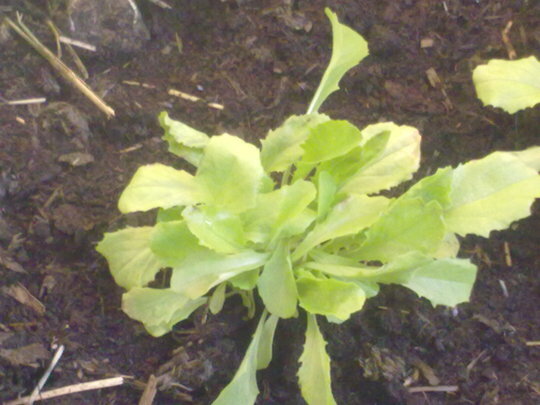 In general it is easier to sow lettuce or salad leaves in a seed tray and then transplant on. Wayne, we all start out as novices and the only way we learn is by experience - which tends to mean making mistakes! Ask as many questions as you need to and know that we will do our best to help you.